Creation: Appeared in Sept 1945 (CTB) as a renumbering of VA 168. Ran from VA 168 (now VA 143) to US 60/VA 31. This is the 2nd VA 162. 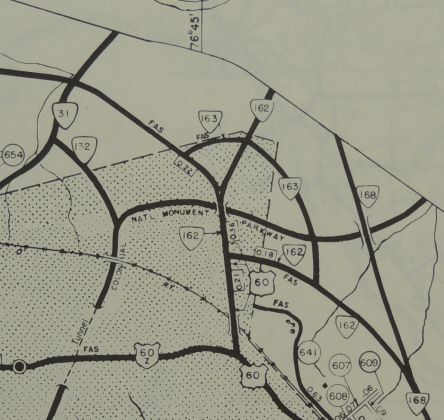 Adjustments: In Jan 1956 (CTB), VA 162 was extended northeast back out to VA 168 (now VA 143), replacing part of VA 31. 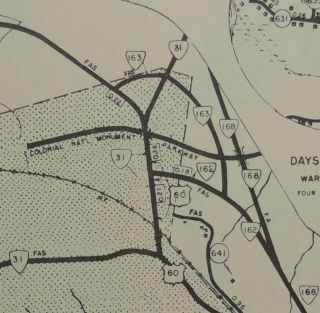 In May 1957 (CTB), VA 162 was truncated back to its 1945-57 routing as VA 31 was returned to its 1956 routing (now VA 5). 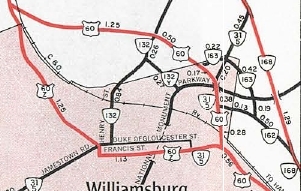 In June 1978 (CTB), VA 162 was extended with US 60 east, then VA 5 west to central Williamsburg, then it replaced VA 132 west back out to US 60 via Lafayette St and Richmond Rd. 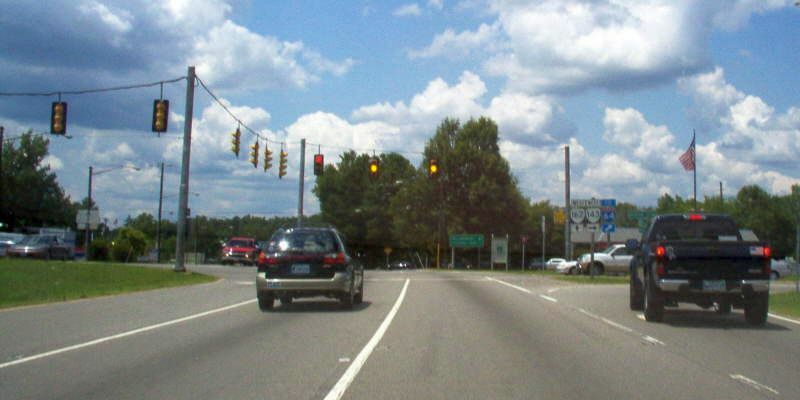 In Aug 1993 (CTB), VA 162 was removed from the City of Williamsburg, leaving behind unnumbered Richmond Rd and Lafayette St west of VA 132; VA 5 on Lafayette St east of VA 132; US 60 on Bypass Rd; unnumbered 2nd St.
VA 162 is first shown as multilaned on its US 60 duplex when it was extended in 1978. Maps do not shown present VA 162 as multilaned but it was when I first traveled it in 1991. Posted: Fully posted; when it still went through Williamsburg it was still heavily posted in cutouts. Comment: VA 162 is a pointless designation as now constituted. It should either be extended to US 60 or dropped. At the very least this should be VA 143-Y. At 0.17 miles I believe this is now the shortest non-facility state highway. VA 162 #1: Appeared in July 1933 as a renumbering of VA 436, running from VA 5 (now US 250) Shannon Hill south to below Tabscott. 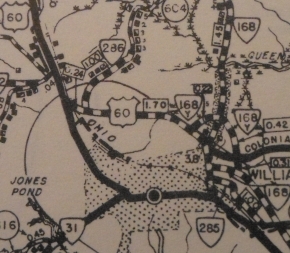 In May 1943, VA 162 was downgraded to SR 605.